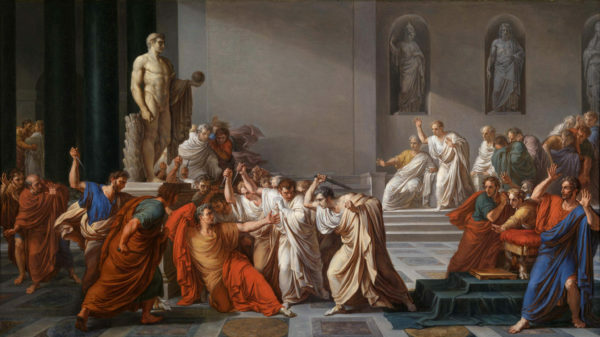 “Beware the ides of March!” This expression is familiar to many of us because Shakespeare used it in his tragedy “Julius Caesar,” named after the famous Roman general and politician who was once the most powerful person in the world. Its warning is one all Americans would do well to take to heart in today’s troubled and confusing times. This is no trivial matter, as we can see by using as an example Julius Caesar, a savvy and courageous public figure and an accomplished military leader who makes Dwight Eisenhower, Lyndon Johnson and Karl Rove look like amateur politicians. Shakespeare wanted this warning to stay with us as we watch the political maneuverings of Caesar’s rivals and the miscalculations that the shrewdly intelligent Caesar makes that will soon cost him his life. But the self-serving actions taken by all of Rome’s leaders and by the people who supported their different factions would lead to increasing violence and bloodshed across the known world and, within a few decades, to the end of the Roman Republic. The strong objections of old-guard Roman aristocrats against the bill and the political chicanery they used to try to block it were based on political self-interests and aimed at keeping Caesar from increasing his popularity and power base. Caesar’s inattention cost him his life. One ancient source calculates that more than 80 conspirators were planning Caesar’s assassination. His opponents were senators who no longer ruled for the common good, if they ever had. They were joined by those who had grown rich with the support of senators and other government officials. They wanted their power and prestige back. They assassinated Caesar three days before he was scheduled to lead the Roman army to wage war against the Parthians in what we now call the Middle East. Our lives continue to suffer under complex problems that self-regarding political leaders refuse to solve. Let us at least heed the ides of March. Tom Palaima is a professor of classics at The University of Texas at Austin. Al Martinich is a professor of philosophy at The University of Texas at Austin. A version of this op-ed appeared in the Houston Chronicle, Waco Tribune Herald , San Antonio Express News, Abilene Reporter News, and Psychology Today.